Arrived in Paris – What about Dutch painting? Yesterday we traveled by Thalys train to Paris. Like all other trains we’ve ridden in Great Britain and The Netherlands it was a very pleasant experience. We did arrive more than an hour late because the train stopped for a signal system failure. The crew’s abundant apologies were unnecessary as far as we were concerned. We were happy that they stopped and waited for it to be fixed! We called JP from the taxi to let him know we were on our way across the city. He met us with hugs, kisses, and wine. We shared a simple cold chicken and cucumber salad dinner on this hot evening. Did I mention that it was 99 F when we arrived? Fortunately this morning it seems to have cooled during the night. I am up early to go to the Charonne Market with JP. JP commented on my previous post and asked why Dutch painting is not my favorite. No, I have not explained my cool reaction to much Dutch painting. First let me say that there is a wide variety of styles, techniques, etc. represented by the last several centuries of Dutch painting. It isn’t fair to categorize them together. Some of the art I love, some I dislike, and some I respect the artist’s talent, but don’t adore their work. After visiting the Vermeer exhibit in London and the Rijksmuseum‘s overview of Dutch painting it became clear to me that Vermeer and Rembrandt stood out from their contemporaries. Many of the old Dutch masters‘ works do not grab me, but these two do. Likewise, I do not prefer most painting from the romantic period of the 1700 and 1800’s. However, there are notable exceptions where romantic artists deviated from their colleagues and make a statement that compels me to look deeply. Turner is the most obvious in this sense. What sets the ones I love apart from their contemporaries that don’t attract my attention? First, they all use light dramatically. They like strong contrasts between light and dark and aren’t afraid to push those extremes a bit beyond nature. Rembrandt’s paintings next to other painters of the period demonstrate his use of what I call the spotlight effect. Others also used dark backgrounds, but they usually fully lighted the subject. Rembrandt carefully created shadows and dark places on the subject. He seems to have paid more attention to the supposed source of light and what it would do to the subject. Turner, of course, took the lessons from Italian painters and painted with wonderful backlighting. The sun is often directly in view in his paintings and he knows this means the viewer must be almost blinded by the light. 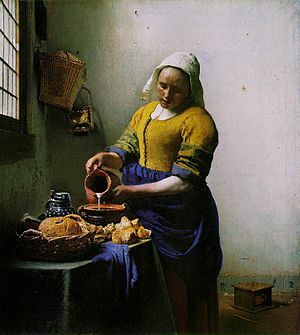 Vermeer used soft light to show the delicate edges that shadows have. While also using extremes of light and dark to create drama. Second, most of the painters in the Dutch school use sharp edges and distinct lines. That is, their subjects are explicitly drawn, almost like a photograph. I have never liked this sort of realistic art. It does not represent how our eyes see the world. When we look at an object all the rest of the world that is in our peripheral vision becomes fuzzy. That is what Rembrandt, Vermeer, and later Turner and a few others of early painting understood and incorporated into their work. You see the main object in focus and surrounding objects become less focused. There are exceptions. For instance in Night Watch Rembrandt painted everyone in focus. However, he used light to differentiate the few people he wanted to emphasize. It creates a visual effect of blurring the shadowed figures, so the effect to the viewer is much the same as if he had used fuzzy edges and indistinct lines. Their contemporaries painted the entire scene in focus with sharp edges and clean lines. It gives a crisp image. Later in the 19th century the impressionists went to almost all fuzzy edges and focused solely on light and color. Third, I love texture. Most of the old Dutch masters used very thin paint applied in multiple washes. The result is a very flat, shiny painting that sometimes doesn’t even show brush strokes. Brush strokes show me the artist’s energy, direction, and intent. Many artists use palette knives and other tools to give more body to their painting. Some go so far as to almost sculpt the paint on the canvas. Turner’s painting are vibrant because of his use of light, but also because of the texture he achieved. I found that Rembrandt and Vermeer, unlike most of their contemporaries, were able to mimic texture through the ways they applied the washes. Using color and tone they were able to show a stubbled face as if the paint was sticking out from the canvas or make us feel the soft nap of velvet. However, most of their contemporaries didn’t do this as well in my opinion. That in a nutshell is my best explanation for why I don’t go gaga over many of the old masters’ works. Light and dark value contrasts, differential focus, and texture are the aspects that attract me to a painting. Thanks for asking JP! This entry was posted in Art and tagged Dutch Golden Age painting, Johannes Vermeer, Rembrandt, Rijksmuseum, Thalys, Vermeer. Bookmark the permalink. 1 Response to Arrived in Paris – What about Dutch painting? At least, I now know why. The funny part is that I would agree with you entirely except for the essential, namely the conclusions. You are right on what these guys do or did, but I do not particularly like fuzzy, I tend to like clean and clear edges. It all boils down to taste and of course that is scary. I hope you recover from the heat wave in Paris. See you reasonably soon, I hope, for lunch!